Durst started at punter. Douglas started at "RB," though he really was a "Big H" in that first set. Auburn rushed 18 times for 126 yards in the first half. Auburn rushed 28 times for 195 yards in the second half. Auburn passed for 85 yards. ULM was 2-for-18 on third down. ULM had a six-possession stretch of consecutive three-and-outs. Auburn's leading tackler was Neiko Thorpe with seven stops. Eric Smith looked much better than I expected during his second-half display. He finished with 66 yards on nine carries. With Tristan Davis' health situation always on the rocks, I think Smith has a real chance to play this season. It's 11:50 p.m. and I'm headed home ... earlier than expected. 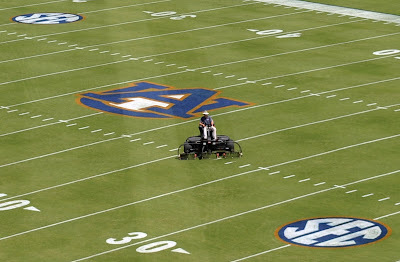 Tuberville and coordinators are available tomorrow, so I'll be in Auburn providing HOT coverage of those events. That's allegedly going down around 3 p.m. I'm sure we'll all interact before then. Just keeping you all informed. JAY IS OUT: I gotta start working on stuff for the newspaper. I'll be back periodically until midnight. I'm not impressed with the offense. Still waiting on statistical confirmation of its mediocrity. I will say this -- ULM was losing defensive control during that final drive. Tackles were getting sloppy. Auburn 24, ULM 0: Brad Lester scores on a 2-yard run. The drive covered 30 yards in three plays. Also, Mario Fannin gained 18 yards on a running play to open the drive. BURNS INJURED: Not sure what happened, but Burns hurt his right leg or ankle. He's now in the locker room. SMITH STRONG IN DEBUT: True freshman Eric Smith is running like a bull during this final drive of the third. He carried four times for 33 yards. Auburn 27, ULM 0: Wes Byrum hits a short field goal. The drive covered 77 yards in 12 plays. Take away Ben Tate's 49-yard run ... and Auburn has gained 101 yards in 32 plays. Yummy. OUT OF THE 'HOUSE? : Robert Dunn is back at WR ... on the next offensive possession after the punt return TD. GREEN BACK: He has resumed duties at LG. DIDN'T TAKE LONG: Auburn fans already booing ... after the team's third consecutive three-and-out late in the period. AUBURN 17, ULM 0: Wes Byrum hit a 33-yard FG @ 1:16. Drive was 63 yards in 8 plays. Still don't know what the problem is. I know Philip Pierre-Louis' first college game is over ... after a 17-yard kickoff return. 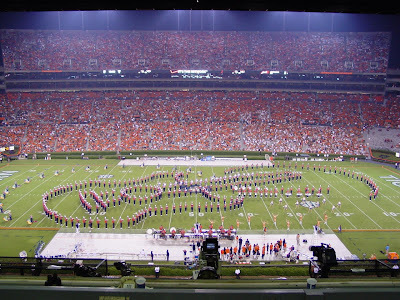 Did you see those funky formations Auburn is running up front? They've got LT Lee Ziemba lined up as a second RT. So LG Tyronne Green is the outside guy on the left side. They did that twice during the first drive. One was a pass. One was a good Lester run that was called back on a hold. AUBURN 7, ULM 0: Auburn's first defensive play of the game. Antonio Coleman appeared to be unblocked off LT. He throttled the ULM quarterback, who fumbled. Mike Goggans picked it up. Easy. AUBURN 14, ULM 0: Robert Dunn, who was in the doghouse, returned a punt 67 yards for a score. That is Auburn's first punt-return TD since the 1996 season. That's a streak of 144 games; the longest streak in the nation. TYRONNE GREEN OUT: Not sure what's happening with that, but Green was subbed in favor of Big Snacks Berry during the team's third drive. Just giving you all a sense of what's happening at Jordan-Hare this afternoon. This may be loud. My "workspace" is pretty darn loud right now, so it's difficult to hear what's happening on the video. Sorry about that. Hey everyone. 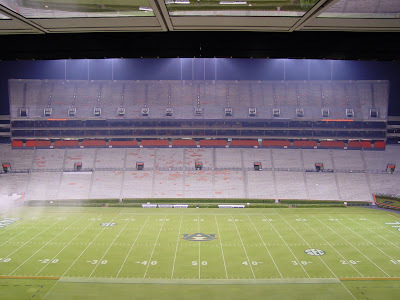 I'm here at Jordan-Hare Stadium. QB ... still being listed as "game-time decision." WLB ... still being listed as "game-time decision." accounts of the game and/or exclusivity as to such rights. I guess that answers the "how often should I blog?" quandary. Hey everyone. I'm so glad for today -- finally something legitimate to journal. I've got a few fresh stories for you. I've also generated a position-by-position look at today's matchup for your viewing pleasure. **Keep in mind here that I have to find somewhere to give Monroe an edge. It's not a terrible team and some of their players are good -- even if the sunshine-pumpin' peeps realize that or not. Breakdown: Does Auburn have talent? Sure. The Warhawks have senior Kinsmon Lancaster, who can pass with accuracy and has plenty of running ability. He has the experience. Breakdown: The Tigers may not have a superstar in the backfield, but they have enough talent and experience. This is the team's best group since 2004. Breakdown: Again, the Tigers have a ton of depth and experience. Mario Fannin and James Swinton bring elite play- making ability to the field. Breakdown: The Tigers' first five guys work well as a group. Lee Ziemba is one of the nation's best tackles and guard Tyronne Green looks strong er than ever. Breakdown: Antonio Coleman and Antoine Carter bring speed off the edges and Sen'Derrick Marks brings the power inside. The first-team group is outstanding. The reserves? Not so much. Breakdown: Yes, I know about Tray Blackmon. He's very good. Monroe returns three experienced juniors who led a good defense in 2007. They are good tacklers and have enough talent to handle business. Breakdown: Jerraud Powers may be 5-foot-8, but he's one of the best cover guys around. Auburn first- team group has some star power. Behind them are freshmen. Good freshmen. Good enough to get the check here. Breakdown: Almost every team in America would like to have Wes Byrum on the roster. He's an outstanding kicker. The return teams look stocked, too, with Philip Pierre-Louis and Chris Slaughter ready to apply their speed. Breakdown: Monroe's Charlie Weatherbie has done some nice things at Monroe -- he may win a Sun Belt title this season -- but Tommy Tuberville has been better for a longer period at a higher level. That's an easy one. AU offensive keys: Offensive coordinator Tony Franklin says he isn't worried about what Monroe will run today. I believe him. Auburn has spent months installing and honing Franklin's system. Today is the day it goes live. There is no doubt that Auburn has the speed and talent to score plenty of points against the Warhawks today. The most important development will be at quarterback, where Kodi Burns and Chris Todd are expected to share time under center. Can this system work? Today could provide several clues. Monroe is in a quandary. It can blitz and overwhelm the Tigers' (meager) blocking resources. If the ball is thrown before the blitz arrives, though, the receiver likely will be in single coverage. Can Monroe handle that matchup? AU defensive keys: Monroe returns seven starters on offense, but many of them are not in the key positions. The quarterback, Kinsmon Lancaster, has some play-making ability. Still, the Warhawks have added three new starters on the offensive line. That's no way to handle Sen'Derrick Marks and the Tigers' conniving ends. Auburn will stay basic and run only its most basic blitzes today. The emphasis will be on avoiding missed tackles and taking correct routes to the ball-carrier. The Tigers know they have enough speed and power up front to repel Monroe's ground game. 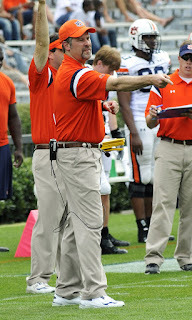 Auburn's tackling was a major concern for de fensive coordinator Paul Rhoads during the preseason. If ULM can get receivers into one-on-one situa tions downfield, things could get interesting. QB Kinsmon Lancaster (No. 7)5-11, 202, Sr. Last season: 174-for-294 (59%) for 1,866 yards and 13 TDs; rushed for 398 yards on 107 attempts. Scouting report: Lancaster has been playing since his freshman year, so he's not intimidated by playing at Jordan-Hare Stadium. He played very well during the second half of last season, making up for a remarkably slow start. He's built to run. Lancaster has no problem scrambling for yardage. His most glaring weakness is that he makes poor decisions when forced to throw from the pocket. Lancaster was intercepted 10 times last season. Tricky coverages can yield big returns. WR James Swinton (No. 16) 6-0, 187, Sr. Last season: 1 catch for 16 yards. Scouting report: Swinton is pure speed and elusiveness. He has played only a peripheral role during his first three varsity seasons be cause blocking was a real problem. Now that Auburn has removed those blocking responsibilities, Swinton looks like a star in the making. Many teammates believe he's the team's fastest straight-line runner. The Tigers think he's a home-run threat. Swinton's catching mechanics weren't memorable during the spring, but he has been much more consistent during preseason practice. Scouting report: Carter surely is one of the fastest defensive ends in the country. When placed on the outside and asked to race toward the quarterback, few blockers are capable of postponing Carter's trip. Can he play the run? That's the only negative. Though he's 20 pounds heavier than last season, Carter still isn't an imposing presence. His ability to bring down ball-carriers will determine his fate: Third-down guy or full-time player. Hey everyone. My homies Bryan and Jeffrey, who run the fine AuburnSports.com site, again have included me in their "Beat Writer Pick 'Em" poll. 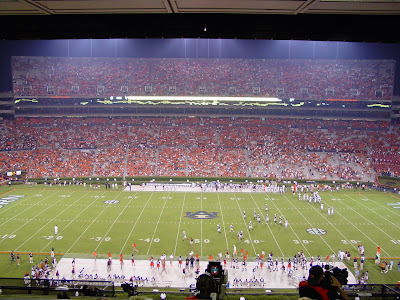 Below the grid, each writer is given a few sentences to forecast the Auburn game. Some of us have fun with it. I started mentioning Tristan Davis every week last year and some of their posters didn't get the joke. Tristan missed the whole season. The posters accused me of having a bromance with Davis. So I'm continuing that trend in 2008. Here is today's "analysis": Jay Tate: Auburn 38-10. With Tristan Davis sidelined with his annual foot injury, Chris Slaughter picks up the pace. The Peach County Prophet will frighten the Warhawks with his excess skill. He'll score one touchdown. He could score three, but he's a team player." The flames will come. I'll advise. You know I'm a Sirius guy. It pains me to pass this information along, but I'm doing it in the interest of all HOTTIES. XM carries all the SEC games. Alabama-Clemson will be on two channels. Clemson's broadcast will be on Channel 191. I doubt you want the other one. Hey everyone. Here is a new video for your viewing pleasure. Hey everyone. Here's a quick look at what Auburn worked on Wednesday afternoon. I have some other stuff going on, so this'll have to be brief. 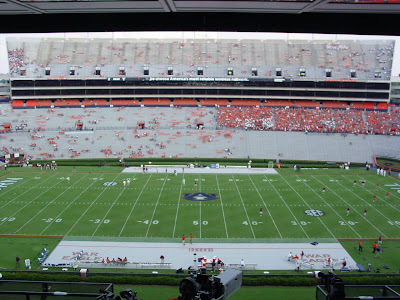 About half of it was at Jordan-Hare, where they worked on substitutions and all that fun stuff. Coach Tommy Tuberville said he saw a few more mistakes than expected, so practice went a little long. I know this is seriously minute ... but Greg Knox, who coaches outside receivers, will coach from the field this season. He's been upstairs in the box since 1999. The only guys up this year will be Terry Price (DEs), James Willis (LBs) and Steve Ensminger (Inside WRs). Tuberville's man behind the scenes, Andy Lutz, also helps those guys in the coaches' box. If you want to see some of those obscure first-year guys (ie LB Spencer Pybus, CB Drew Cole, DE Cam Henderson) keep an eye out during special-teams situations this weekend. Tuberville said they'll be using more freshmen than usual in those roles. Not sure why, really, because it's not like those guys suddenly will make the varsity roster with a big hit or something. I guess it's good to give those kids a taste of the good life before subjecting them to five months of redshirt workouts. Auburn's significant injuries: DE A.J. Greene (hamstring), DE Jomarcus Savage (shoulder), WR Montez Billings (hamstring), TB Tristan Davis (foot/ankle). Alright you all. It's time for you to give me some ideas. How should we handle game days around here? Do you all plan to check the HABOTN during the game? I used to kinda blog as important things happen, but I was never sure how many of you all were coming here while the game was in progress. Maybe a "Here's What We Learned" kind of recap afterward? My players of the game? I've also thought about letting a few HOTTIES provide a "highs and lows" assessment we all could discuss on Sundays and Mondays. Is that even remotely interesting? I don't know what's best when it comes to HABOTN + games. I really don't. The Montgomery Auburn Club is holding a preseason shindig Thursday night over by Jubilee Seafood. It's in that building that used to be Kat and Harri's. That's the best way I can describe it. Cost: Free for MAC members; new memberships are $25/individual or $30/family. Questions: Email me at jgtate@gannett.com and I'll get it handled. Hey everyone. We've got some news. I'd consider this big news to those of us who think about the Auburn football program at least eight hours per day. WR Robert Dunn has been demoted to the fourth-team offense. I know what you're thinking: Suspension? Grades? Neither. Coach Tommy Tuberville said Dunn is in the "doghouse," but will play this weekend. Dunn remains the top guy on punt returns. The revised depth chart at "H" receiver looks like this: T. Zachery, Darvin Adams, Mario Fannin, Dunn. DE Raven Gray is going to redshirt this season. I told you all he was messed up! Tuberville said Gray's surgically repaired knee hasn't responded as well as hoped, which means Gabe "Spuds" McKenzie now is the No. 2 guy on the strong side. You see what I'm talking about on the radio in regard to depth? I like McKenzie, but he was a tight end last week. WR Montez Billings looks like he'll miss this game with a hamstring injury. Auburn's newly released depth chart has Frenchy at No. 2 "Z" receiver and Quindarius Carr at No. 3. CB Neiko Thorpe and CB D'Antoine Hood will run with the second-team defense. SS Jonathan Vickers is listed as the No. 2 guy behind Mike McNeil. That means freshman Christian Thompson officially is on the third-team defense, but I think that's just a nice way to give Vickers some respect. He doesn't have much speed. TB Brad Lester said today than TB Tristan Davis is really struggling with his latest foot injury. Tuberville also made it clear that OG Chaz Ramsey is headed for a redshirt, though he stopped short of official confirmation. It's obvious that Byron Isom will have that job unless he bottoms out or something else unforseen occurs. Hey everyone. I made another appearance on the WMSP morning show today. Not much going on there, though I pointed out how weird it was to me how many folks figured Ben Tate clearly prefers Kodi Burns. We already have another satisifed customer. Jay G here is one for you to post on your blog. You are a bitter, childish beat writer that has tried to get another job for 10 years now. When you come on John and Barrys show and predict Auburn to win 8 or 9 games and say your leaning to 8, then you go on the Round Table and predict 10 wins and say I quote, "they are going to be very good if not great" what Auburn fans suppose to think? JAY G SPEAKS: Hey Carney. Thanks for your support. Opinions evolve and, yes, mine evolve as well. I believe this is a 9-win team. If I had to go higher or lower than that, I'd now go higher. As for "trying to get another job for 10 years," you simply aren't aware of the facts. Thanks for playing. Hey everyone. Some funny stuff from Clemson defensive coordinator Vic Koenning, who recruits southern Alabama for his program. About Julio Jones and Burton Scott, two Alabama freshmen from Mobile. Hey everyone. The SEC just announced a 15-year partnership with ESPN, which ensures that more conference games in all sports will be televised on The Worldwide Leader. New 15-year deal begins in 2009 and runs through the 2023-24 season. The Sports Business Journal reported Monday that the deal is worth $2.25 billion. With a B. That's approximately $12 million per school per year. 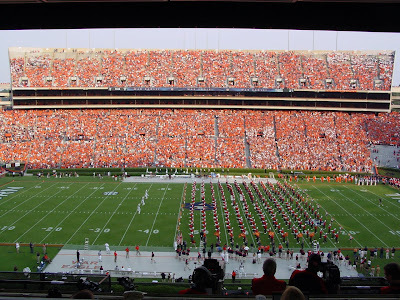 Auburn's current athletic budget is just shy of $50 million per year. ESPN expands its "ESPN Regional Television" enterprise and will use that to telecast everything previously handled by Raycom/JP/Lincoln Financial. That includes the 11:30 a.m. football games ... beginning next season. ESPN expands men's basketball coverage significantly, adding the SEC back into the "Super Tuesday" slot and creates a Saturday slot. Games will continue to be televised on Wednesdays as well. They'll still be showing the two Saturday games per week and two Thursday games (per season) ... and will triple the basketball offerings. They'll televise three nights of men’s basketball per week and present SEC Championships in women’s basketball, baseball, softball and gymnastics. The semifinals and championship of the SEC Men’s Basketball Tournament will be televised on ABC. 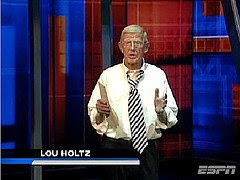 Lou Holtz will spit his way into millions more homes each weekend, which surely will enrich the lives of caustic fans across the country. His down-home colloquialisms add so much to ESPN's coverage and I, for one, am looking forward to many more years with Coach Holtz providing us simulated pep talks and pointless rants. ESPN has acquired rights to every SEC home football game (excluding those on the network broadcast package) and will serve as the exclusive national cable home and the syndication rightsholder for the conference. ESPN and ESPN2: The networks will increase coverage by combining to televise a minimum of 20 SEC games annually, including Saturday night and two primetime Thursday matchups. ESPNU: It will present a package of SEC football for the first time, with a Saturday game-of-the-week (generally in primetime and a minimum of 13 games annually). ESPN Regional Television (ERT): The nation’s largest syndicator of collegiate sports programming, becomes the official over-the-air syndication home for the SEC and will feature a game-of-the-week package (generally at 12:30 p.m. ET), with a minimum of 13 games each season. In addition, ERT will produce and distribute a studio show. ESPN360.com: Simulcasts of SEC game telecasts will be offered on the broadband network. ESPN Mobile TV: Live games will be simulcast on mobile phones. ESPN International: The agreement includes global rights to present live games and encore presentations. ESPN Deportes: ESPN has acquired domestic Spanish-language rights for SEC football on the 24-hour, U.S.-based network. ESPN GamePlan: The out-of-market college football pay-per-view service, will offer SEC action. 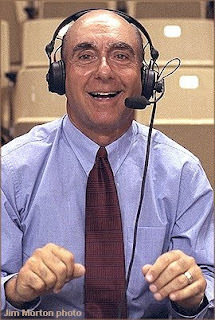 ESPN Classic: The network may telecast select SEC live games as well as historic and immediate encore presentations. ESPN.com: Extensive SEC content, including highlights, will be presented online. You're looking at SEC games three nights per week (Tuesday, Wednesday and Saturday) on ESPN and ESPN2. The SEC will also continue to participate in an annual inter-conference basketball challenge event (e.g. – SEC/Big East Challenge). ESPNU will televise seven intra-conference and five non-conference games. ABC will televise a minimum of two regular-season games each season plus the addition of a national telecast of the SEC Tournament Semifinals and Championship Game, giving ABC its first entry into the annual Championship Week. ESPN Regional Television (ERT) takes over rights to SEC syndication and will produce and syndicate a minimum of 37 intra-conference games each season throughout SEC territories and beyond. This replaces the Raycom/JP/LFS telecasts. Hey everyone. Let's get to business. We'll start with video. Juicy stuff below. Still no "solution" to the quarterback quandary. OC Tony Franklin said he's still evaluating, but reiterated his stance that both quarterbacks will play. ``They're both going to play," Franklin said. ``I think that's the most important thing. It will probably be more important who finishes the game rather than who starts the game. TB Ben Tate said he now supports one quarterback over the other, but declined to identify his favorite. ``I think everybody can pretty much see who should be the guy out there," Tate said. ``It doesn't really matter as long as our team wins the national championship. It doesn't matter who's back there throwing it. TB Tristan Davis was back at practice today. Coach Tommy Tuberville said Davis was "100 percent," though Tate said Davis was running with a limp. Tuberville sounded pretty down on DE Raven Gray, who hasn't emerged as a valuable option on the strong side. Tuberville said Gray "will have to get a lot better" to even play in the Monroe game, adding that Gray isn't in the two-deep right now. Who is on the two-deep? All indications are that Gabe McKenzie is Michael Goggans' backup on the strong side. McKenzie, as you probably know, has been playing defense less than a week. He was a tight end for four years before making the switch last week. Tuberville said No. 2 "X" receiver Montez Billings has injured a hamstring muscle and is "doubtful" for the Monroe game. So does that mean Mario Fannin is due for a de facto promotion? Not so fast. Tuberville said he's looking at Quindarius Carr and PPL in that slot. Don't panic, Fannin fans. I'm hearing more and more about Fannin playing a variety of positions against Monroe and beyond. He has taken practice snaps at TB, "X", "Z" and "H" ... so expect to see him plenty. "... they low down, they dirty, they some snitches." Had to pass this along. One of the old-school HOTTIES, Bo from Dothan, reminded me how great this kid is. I know ... this made the rounds late last year. That doesn't make it any less funny. "They low-down, they dirty, they some snitches." "I'm not a dog person." "Neyland Stadium looks like a garbage-truck worker convention." "I hate all of their quarterbacks." "It's that throw-up orange. It's not that orange that you can sit with. It's that puke, inside-of-a-pumpkin orange. And I don't like pumpkins." "They're sore losers because they're not Alabama." And to drive the point home: "I hate Tennessee. I can't stress that enough."